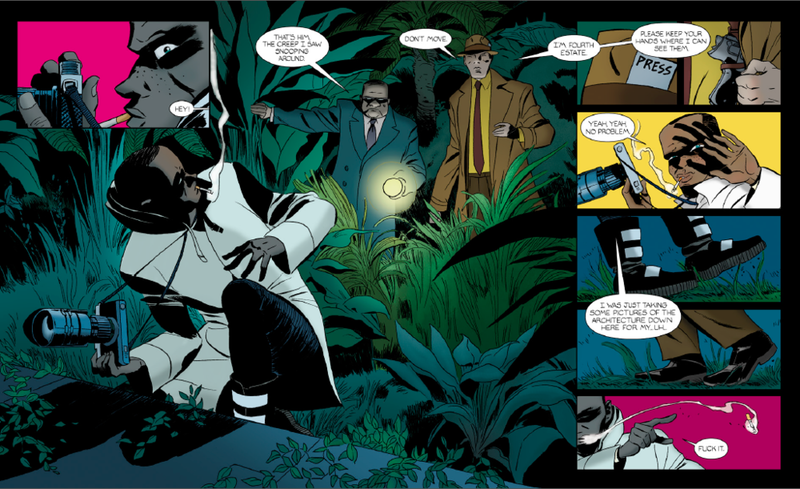 Warning: mild spoilers regarding the overall premise of the comic The Private Eye. All images are from the comic and can be purchased here. The Private Eye is a unique experiment in many ways. A thought experiment, a unique format, hell, Brian K. Vaughan, Marcos Martin and Muntsa Vicente elect to diverge from how the medium is even sold. 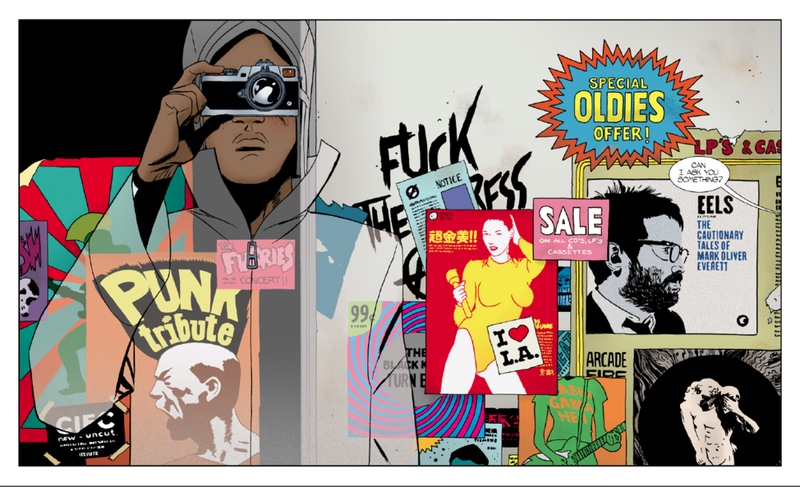 PANELSYNDICATE has every issue and both volumes of the comic available to the masses in a pay-what-you-want format. 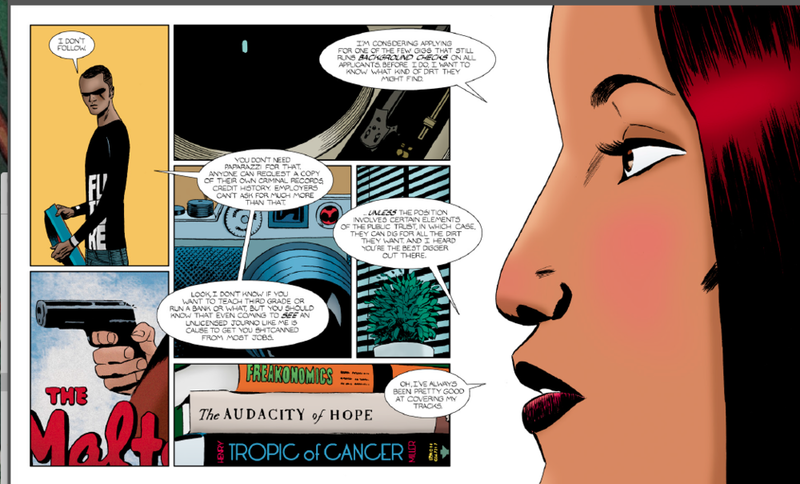 Every single thing about this comic book from the opening pages tells you that this is no ordinary experience, or book. In this cyberpunk future, Paparazzi are still despised and hunted...but not for the same reason we know today, there's a twist. The comic follows a young P.I who works to get at the truth behind the facade people put on, "literally". You see in this future there is no Internet, none at all. The ramifications are really interesting. People have real-life avatars, of a sort. If you're "low brow" you'll essentially be wearing a costume; if you're rolling in dough, you might have a hologram, instead of a mask, covering your face. Everyone is obsessed with their privacy and people are not messing around. If you want to find anyone who is old enough to drink, you'll need a P.I; the paparazzi. Who chases them? The Press! In a wonderful inversion, the people who dole out justice are the people who write and fight for inches and columns. The F.B.I? You mean the national news, of course. There is bad journalism and good, but what really matters is the statement that the truth is synonymous with reporting. Something sorely missing, here and now. Justice is something you have to see with your own eyes, electronic surveillance is a bust. It doesn't exist. People live multiple lives, present multiple avatars, appearances, and have multiple identities (in terms of government issued I.D). Humanity's need to define itself has spilled out onto the streets, in order words. Because the Internet is gone, this alternate future went a different way. Still filling the cracks and holes we find in our online world now, though. It makes for an extremely interesting setting. And it begs the question: what the heck happened? The ramifications of the cloud being globally disseminated are felt throughout the story, though not fully explained. We follow P.I who has a series of flashbacks from time to time, fleshing out the world some more, along with his life and his fundamental motivations. But the real effectiveness of portraying the world full of secrets by showing the avatars being lived in folks while also never having more than the broad strokes of what happened expounded upon, Is the tension. What fun are masks, avatars, and cyphers when the fear of being unmasked isn't online anymore; it's present. And from time to time people mention the event that changed everything, simply referred to as "The Flood." Things aren't peachy. Figures. We don't even learn the actual name of P.I for some time in the comic. But we do know he's subversive. It's depicted In his choices of what he imbibes, his reading list, his choice of profession; everything, really. He won't even get a drivers license. And in this freedom for himself and his identity, comes his weakness: the reliance upon others who are integrated into the system. He needs a wheel-woman to get around. He needs his clients to survive. He needs them happy, too. He's just out there trying to earn a living, unmasking folks by word-of-mouth business practices and keeping the lights on. So when a client that hires him to dig up dirt on them in order to be vetted for a high ranking position ends up dead, P.I is forced to go on the run and try to uncover the mystery himself, lest he be charged with the crime himself. The world isn't that different, either. The largest changes from our society are shown right away but as we read more, society really seems fairly similar. This is effective at creating an ever-present sense of the uncanny in the book, leaning into the noir roots. The commentary on technology is nothing new for cyberpunk but the presentation, along with the reshuffling of certain aspects of society, is perhaps the most elegant way to be provocative. The hunger of humanity to take and never be satiated did not come from the Internet it was inserted into it because we created it. And that hunger merely takes a different form without it present. The fact that your kink can be your mask still does not make it OK, in the eyes of society. The need to connect with others, desperately, as the technology that makes our lives easier stands in for the real work we ought to be doing, results in an untenable situation; always. The Internet was never the problem. And of course, we already know this. In addition to these cyberpunk themes, ever present. We also get to enjoy a noir tale, a coming-of-age story, and some solarpunk ideological stances—all mixed into one. It lays bare some fundamental questions and extends questions about our relationship to the Internet in some fairly terrifyingly effective ways while remaining morally grey; ultimately tasking us with providing answers. This book tells you what it's about when it shows you, before it tells you, that what P.I consumes, he is. From then on you'll find no comfort in these pages—and I wouldn't have it any other way.